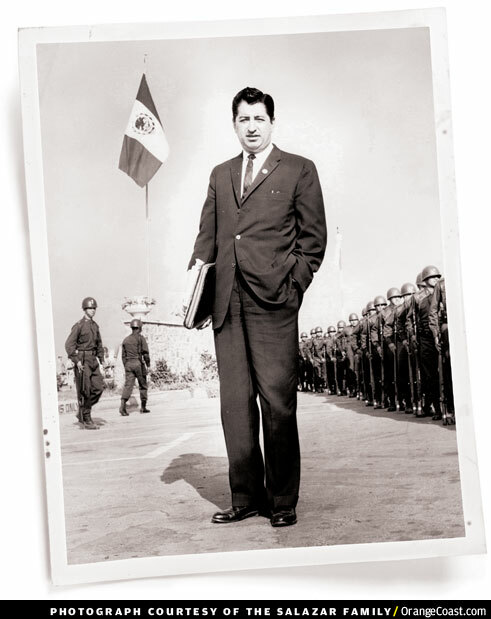 Not yet 10 years old in 1970, the two daughters of Ruben Salazar weren’t aware that their father was one of the country’s most prominent Latino journalists. But they knew he wrote for a newspaper, the Los Angeles Times, and that he worked long hours because they usually ate dinner before he got home. They lived in a newly built tract house in Santa Ana, when the city was predominantly white—along with the rest of Orange County. Nearby were marshes and a sprinkling of strawberry fields and, less than two miles away, the lima bean fields from which the already impressive South Coast Plaza had begun to sprout. Salazar, a Times columnist and news director of pioneering Spanish-language KMEX-TV, was covering the National Chicano Moratorium Against the Vietnam War, a protest in East Los Angeles on Aug. 29, 1970. The gathering estimated at 30,000 people turned violent when police went into the crowds. As the unrest continued, Salazar and a KMEX colleague ducked into the Silver Dollar Bar on Whittier Boulevard at Indiana Street—many blocks from the event’s epicenter—to use the restroom and have a beer. The riot claimed two other lives, resulted in more than 60 injuries, and led to about 200 arrests and property damage in excess of $1 million. But Salazar’s mysterious and troubling death dominated the headlines, making him an enduring symbol of the mayhem. A new PBS documentary, “Ruben Salazar: Man in the Middle,” which airs nationally on April 29, is the most comprehensive look to date at Salazar’s life, times, and legend. Drawing from family archives—including Salazar’s personal journal—and revelations from long-suppressed law enforcement files, the one-hour program provides missing pieces within the context of agitated times. There was a much-publicized 16-day inquest, which produced 2,025 pages of testimony from more than 60 witnesses, and 204 exhibits. When it was over, Salazar’s death was deemed an accident. No criminal charges were ever filed. His ensuing martyrdom led to myriad tributes. The 8.4-acre park where the moratorium took place today is known as Ruben F. Salazar Park. There are namesake community centers and schools. A 2008 stamp from the U.S. Postal Service commemorates his work as a journalist, as do scholarship programs. muralist David Alfaro Siqueiros. A corrido by acclaimed guitarist-singer Lalo Guerrero laments his fate. In the theater production “Cesar & Ruben,” written by Ed Begley Jr., Salazar has a fictional encounter, set to song, with labor activist Cesar Chavez. Another play, “The Silver Dollar,” once was restaged at the bar where Salazar was killed. The paper would later applaud Salazar as “an early and eloquent explorer of the Mexican-American experience [who] wrote from the ground up.” He continued as a Times columnist when he went to work for KMEX, where he intensified his coverage of the Chicano scene shaking up Los Angeles. According to some colleagues, he was beginning to empathize as well as investigate. The documentary explores Salazar’s conflicts—and his parallel professional and personal lives. When the files were made available in 2011, Rodriguez and the Salazars found details they hadn’t known and photos they’d never seen—including disturbing crime-scene images—but no concrete evidence of a conspiracy, large or small. “Ruben Salazar: Man in the Middle” airs at 9 p.m. April 29 on PBS SoCal. To learn more about Salazar, click here. Next articleWine Recommendations—Where Do You Go?